Hawaii Trip | The Aulani Experience Part I. My cousins Tony and Kit tied the knot on the Hawaiian island of Oahu last week, and I was honored to have been their wedding planner. We had worked together since last September, so it was exciting to see everything come together. While planning the itinerary for Alan, Bridgette and I back in January, I knew I needed to keep them entertained while I worked during the days leading up to the wedding. 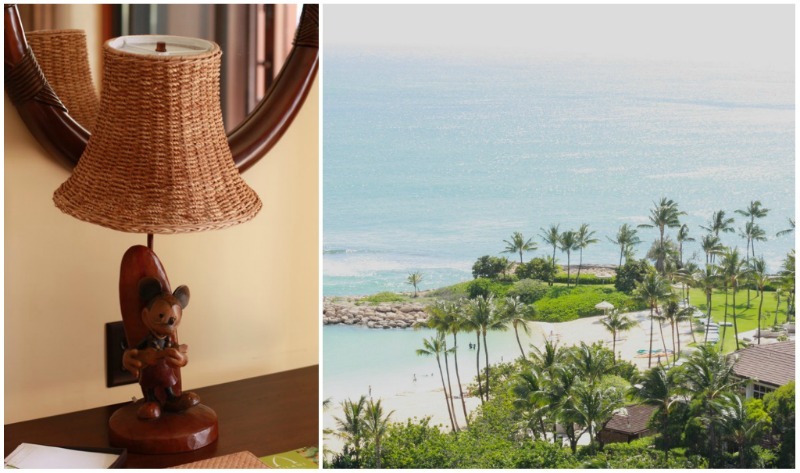 How appropriate that located right next to the wedding venue, was Aulani, the brand new Disney resort at Ko Olina. We arrived to Honolulu on Thursday, two days before the wedding, and checked into the Aulani. My assistant Amanda and I had to jump right into work, with pre-wedding walk throughs and meetings, so Alan braved the parental duties on his own. 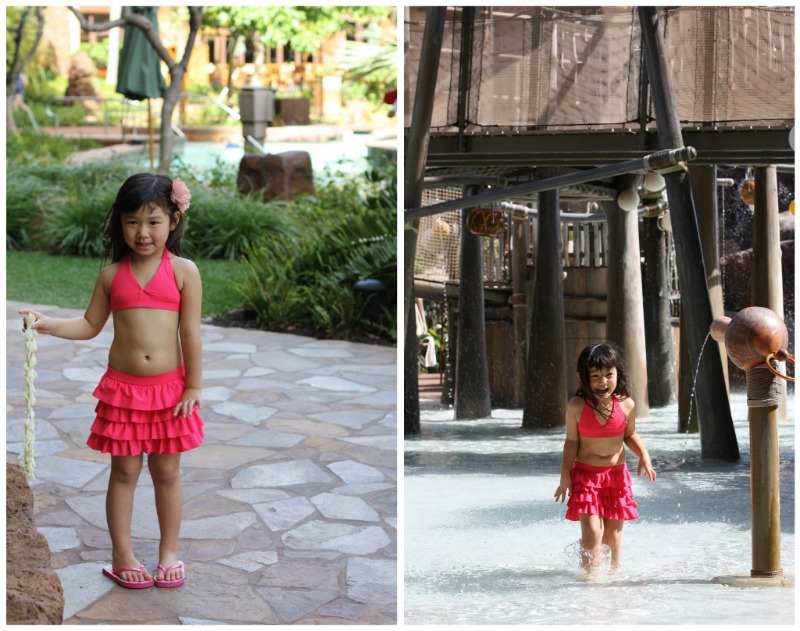 Together with all that Aulani had to offer, they entertained Bridgette for 3 whole days. Ko Olina is about a 30 minute drive from Honolulu airport, and is located on the west side of the Oahu island. Upon arrival, you’re greeted with leis, lemon infused water, and lots of happy smiles before you are taken to the front desk for your check in. The entrance to the lobby opens up to a spacious deck that overlooks the faux volcano, pools, and lazy river at the center of the resort. 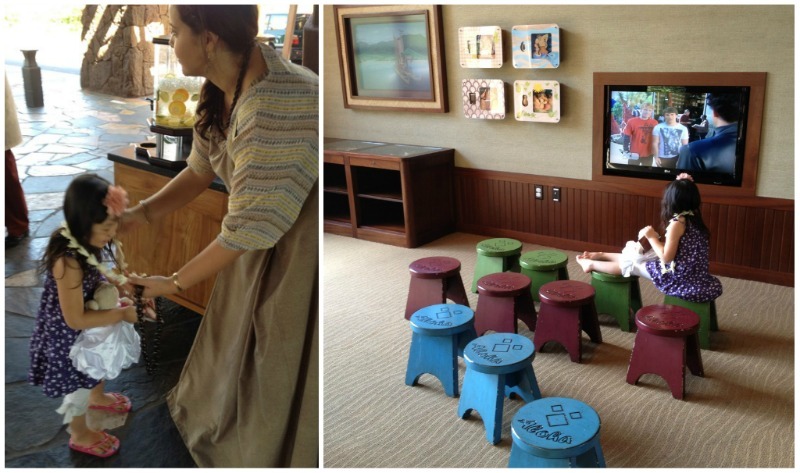 While we waited to check in, Bridgette was entertained with Disney movies playing in a small open room adjacent to the front desk–how thoughtful of Disney, right? Our room was a pretty “standard” hotel room with a very small balcony, and the only real Disney element we found was the Mickey Mouse lamp on the desk. We did get a nice view of the ocean though, which was definitely a perk. The entire hotel is designed around a Hawaiian setting, more so than a Disney theme. It’s the occasional Disney characters seen on site that provides the Disney element to the hotel, but still, it’s a fairly nice resort with amazing amenities designed with children and families in mind. Not a bad room view, right? 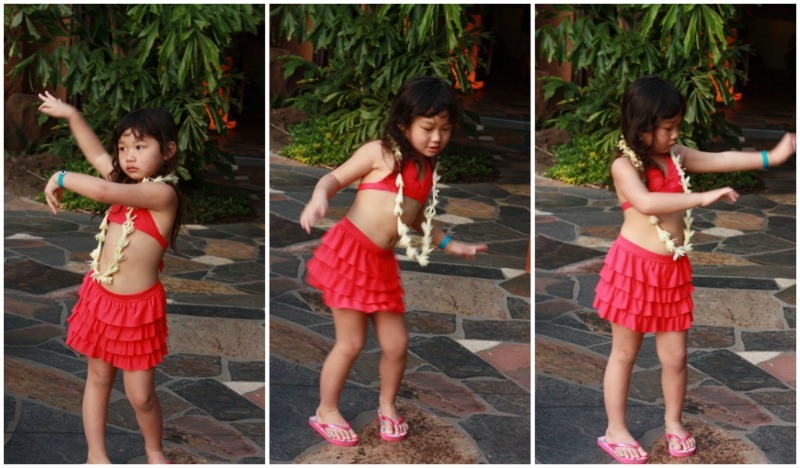 Eager to show off her hula dancing moves already! Bridgette wasted no time. 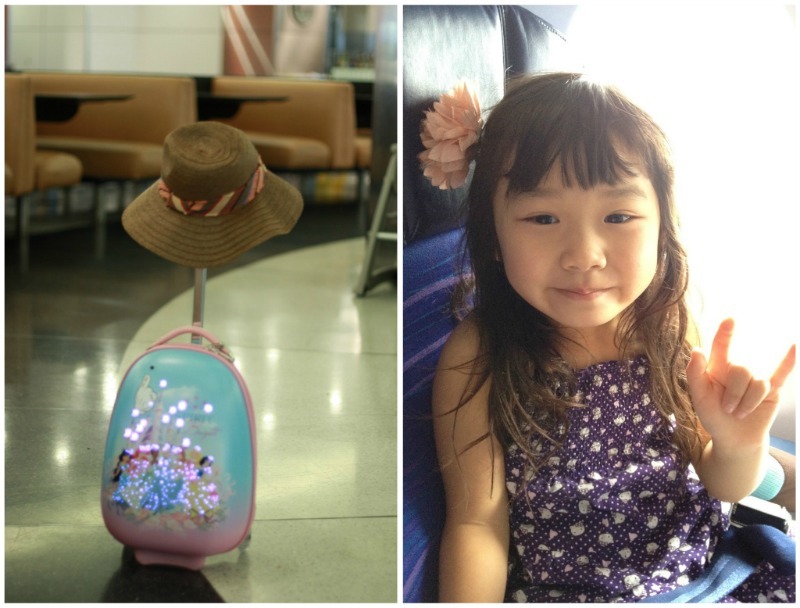 The minute our luggages were delivered to our room, she stripped her clothes off to put on her new bathing suit. It took all of 5 minutes to get her and Alan into their swim attire (why can’t she be this efficient when getting ready for school in the morning??) before we headed downstairs. 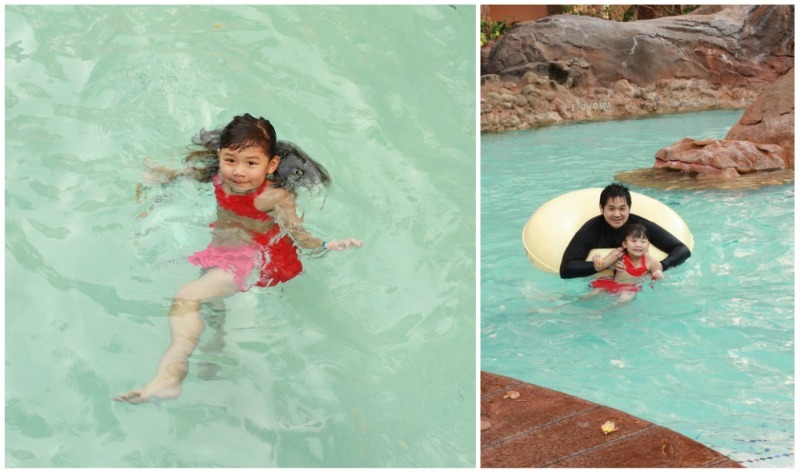 She made a beeline to the water structure that included mini slides, bridges, and fountains. The slight chill from the late afternoon wind didn’t seem to bother her at all as she excitedly took in all the fun things around her. 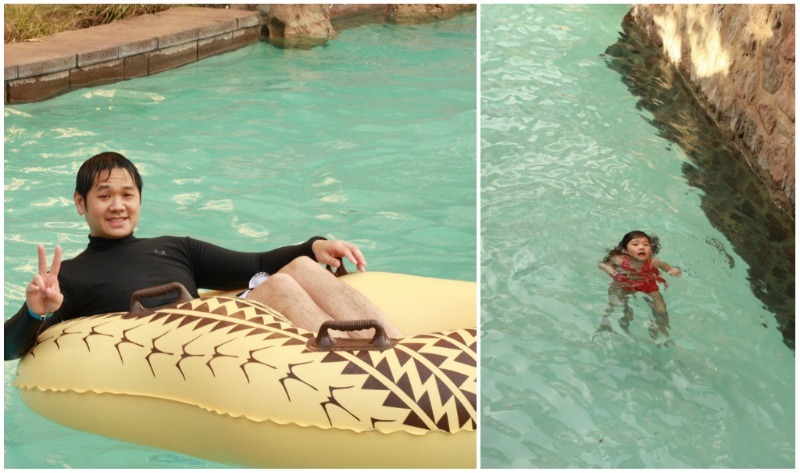 I had to leave for my meeting shortly after that, so she and Alan spent the remainder of the afternoon eating by the poolside, swimming, and floating down the lazy river. I returned around dinner time to find Alan floating on the lazy river in an inner tube and Bridgette trying to stay float without her swim vest a few feet in front of Alan. I admit that it’s a wonderful thing for Alan to help Bridgette build her self-confidence by allowing her to push her own limits, but I do get antsy from time to time because I worry that he pushes her a little too much. Seeing Bridgette in the water by herself without her swim vest is one of those times, but she did seem perfectly comfortable. Looks like the hula lesson she got at her friend Karina's birthday party last year really paid off! 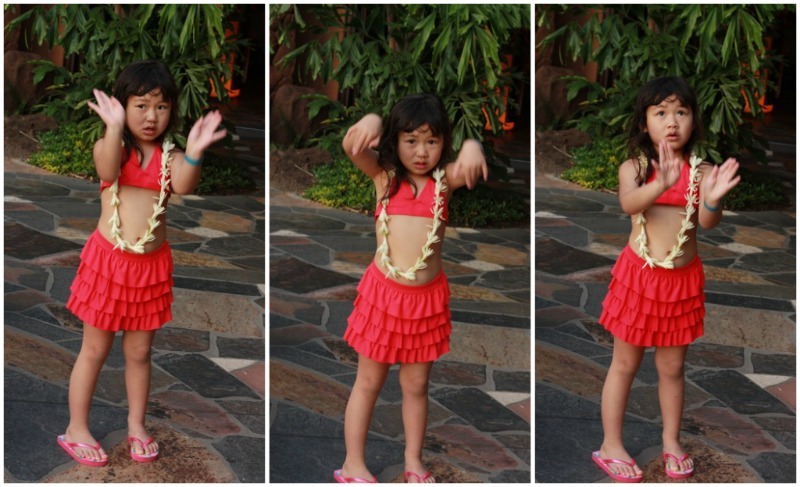 That first night in Ko Olina, we enjoyed the dinner buffet at Aulani. The quality and variety of the food was very mediocre and below our expectations, but we did enjoy the fresh crab legs and oysters! On our second day, I left bright and early for another pre-wedding meeting while Alan dropped Bridgette off at Aunty’s Beach House, which is the “Kids’ Camp” at Aulani. I had signed Bridgette up for their Fish Are Friends half day adventure that day, from 10am-2pm. Aunty’s Beach House is a wonderful indoor place that’s filled with activities to keep children entertained. From dress up clothes to computer games to Disney movies, children of hotel guests between the ages of 3-12 can stay there from 10am-10pm (complimentary!) and still not run out of things to do. Each day, they also have what they call “Premium Experiences” which requires an additional fee. We were most impressed by the security measures at Aunty’s Beach House. In addition to the usual paperwork that you have to fill out, they check to be sure you are indeed a guest at the hotel, and they give each child a small GPS devise strapped onto their wrist, enabling them to track the child down at any time. The gates to get inside Aunty’s Beach House are also locked at all times, with the reception desk just a few feet away, so nobody can cross the gate without checking in at the reception desk first. Each evening at turndown service, there is a pamphlet left in our room to detail out the activities on the next day. 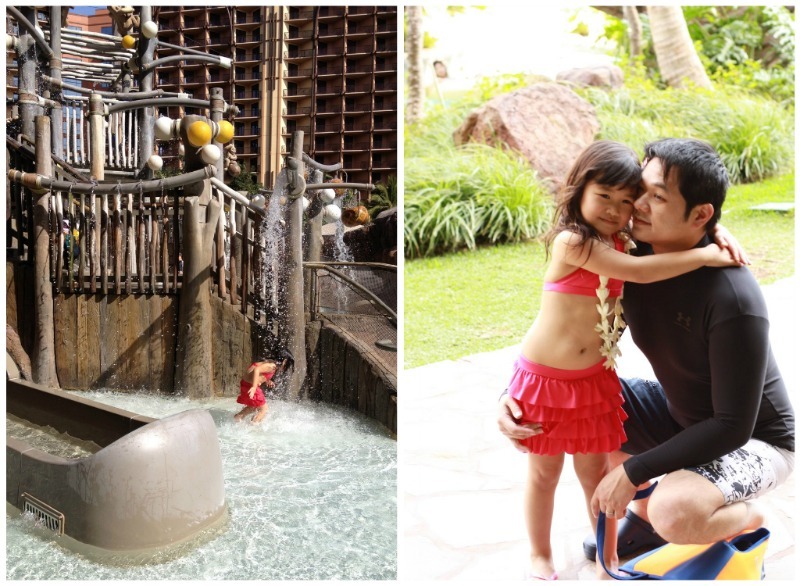 From storytelling by the fireside to pool parties with Disney characters to various craft projects, let’s just say there is no shortage of children-friendly activities at the Aulani. They even have movie nights outside, where you can just lay on the lawn to watch Disney movies! 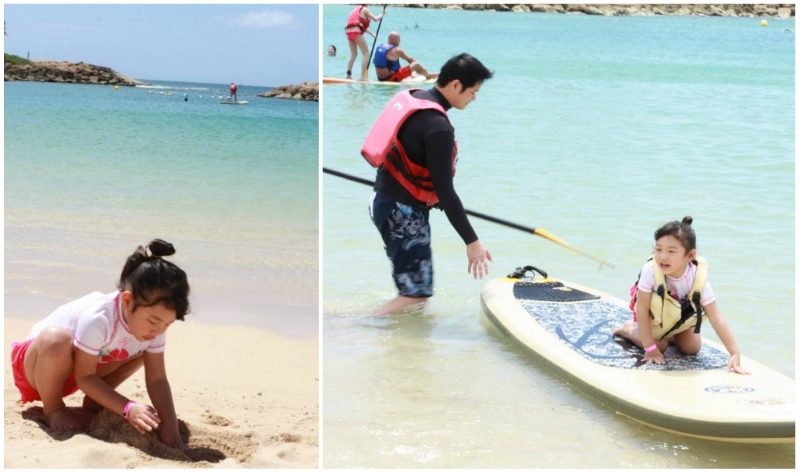 If you get tired of the Aulani pools, the lagoon beach is just a mere few steps away where the water is calm and safe for children. Bridgette loved paddle boating for the first time, making sand castles, and soaking in every last bit of that beautiful Hawaiian sunshine! 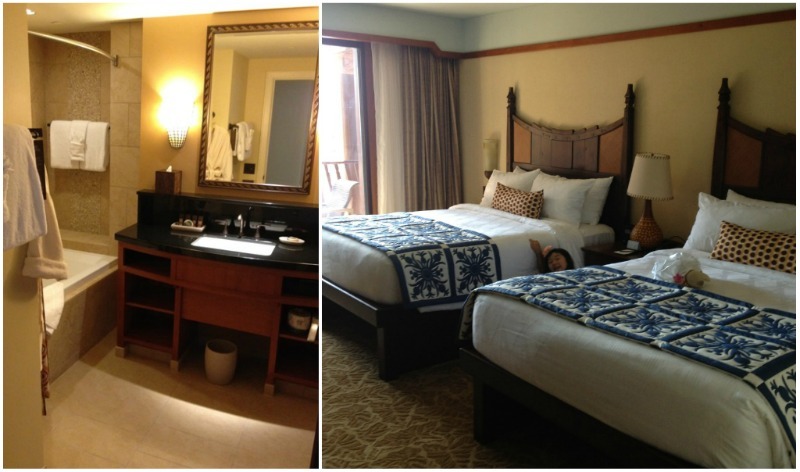 Next PostHawaii Trip | The Aulani Experience, Part II.